Norgay (1914 - 86) Hunt (1910 - 98) Hillary (1919 - 2008) 25th Anniversary First Day Cover stamped 29th May 1978 celebrating the first ascent of Mount Everest. This is an official issue of the Kingdom of Nepal and comes in a commemorative folder and letter from the Franklin mint. The First Day Cover is signed by Tenzing Norgay and Sir Edmund Hillary. 70 and written Everest 1953 under his name. A wonderful combination and highly collectible. Offered by UACC Registered Dealer #175. We have been featured Worldwide and are winners of the prestigious Universal Autograph Collectors Club (UACC) Dealer of the Year 2010. We offer a COA with all items. 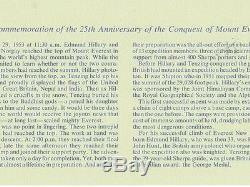 The item "MOUNT EVEREST Signed 25th Anniversary First Day Cover stamped 29th May 1978" is in sale since Tuesday, February 28, 2017. 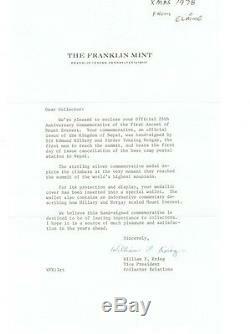 This item is in the category "Collectables\Historical Memorabilia\Other Historical". The seller is "robert-saunders-autographs" and is located in Capalaba, Queensland. This item can be shipped worldwide.